Posted April 16th, 2014 at 2:43 pm. The Bryn Mawr College Library has received a one-year planning grant of $39,650 from the National Endowment of the Humanities to develop a digital portal containing letters, diaries, and scrapbooks of the first generations of its students. This collaborative project also includes the libraries of Barnard College, Mount Holyoke College, Smith College, Vassar College, Wellesley College, and the Schlesinger Library, Radcliffe Institute for Advanced Study, Harvard University. This group of schools, once known as the Seven Sisters, educated many ambitious, socially conscious, and intellectually committed women, and their graduates became prominent leaders in philanthropy, public service, education, and the arts. Attending college in the early years was an intellectually and socially awakening experience, and it also provided an occasion for extensive letter writing to family and friends, and to keep diaries and scrapbooks that preserved their impressions, ambitions, and memories of these first years of independence from home. Large numbers of these student writings are now preserved in the libraries of the seven schools, and have the potential to serve as a rich collected resource for understanding a wide range of issues in women’s history and beyond. 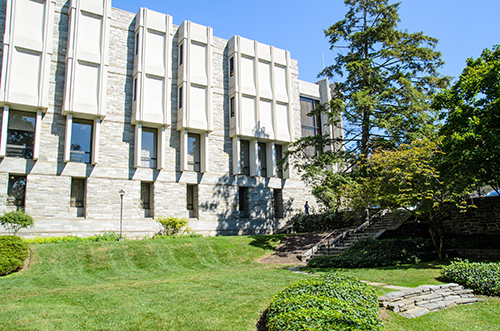 The collections include discussions of race and class, political reform and women’s rights, sexuality and body image, the experience of being Jewish or Catholic at predominantly Protestant institutions, interactions with students from Europe and Asia, and the experience of living through wars, the influenza pandemic of 1918-1919, and the Depression. Currently, public use of the collections is impeded by their dispersal across the seven campuses and by the limited status of digitization of the items. The long-term goal of this project is to develop common standards for cataloging, taxonomy, transcription, and digitization of these papers such that they might be accessible to the public through a single portal. The History of Women’s Education Open Access Portal Project is being directed by Eric Pumroy, associate chief information officer and Seymour Adelman head of Special Collections at Bryn Mawr, and developed out of the work of The Albert M. Greenfield Digital Center for the History of Women’s Education at Bryn Mawr and its former director, Jennifer Redmond. The project has been made possible in part by a major grant from the National Endowment for the Humanities: Exploring the human endeavor. The grant is from the National Endowment for the Humanities Preservation and Access Division, and is part of the Humanities Collections and Reference Resources “Foundations” grants. These grants support the formative stages of planning, assessment, and pilot activities for initiatives to preserve and create access to humanities collections or to produce reference resources.